Picking a gift for your loved ones isn’t always simple, especially when you want to mark an important event in their lives or make a strong impression. Many times we wander around looking for the perfect item, something that fits the person’s character and passions, something that will be kept as a memory for a long time. A custom made bobblehead based on their appearance is a sure way to surprise them with a gift they will surely have on display for years to come. Who wouldn’t like a mini version of themselves greeting them with a friendly nod all the time? The possibilities for personalizing these fun dolls are endless and a lot of manufacturers are capable of creating high-fidelity reproductions of a person based only on some photos. You can also add props, custom bodies. Over the last decades, bobbleheads made a huge comeback on the market and they are not only destined for collecting. Companies use these amusing dolls as promotional items, sports teams give them away at their games and the movie industry launched hundreds of models shaped after their most beloved characters. With such a big market, a lot of companies compete to deliver high quality and different means of customization for their products. You can find manufacturers online and all you have to do is choose a standard or custom body, select the color of the hair, eyes, complexion and clothing and choose props or other accessories for your doll. You then send pictures of the person you want to surprise, preferably from different angles for a high accuracy of the reproduction. If pictures are not available, the artists can work with detailed descriptions and you will be in touch all the time to get exactly the doll you want. Most companies keep you posted about each step in the production, allowing you to deny or approve the product before it is shipped. This guarantees your satisfaction with the end result. Originally, bobbleheads were made using paper mache, a frail material that didn’t stand the test of time and wasn’t so flexible when it came to custom features. Nowadays, technology allows us to create detailed replicas of a person with durable materials, like plastic, resin or polymer clay. If you want to get a more traditional doll, you can find artists that work with clay and fabrics, the resulting doll being a more valuable, one of a kind item. Keep in mind that these materials are less durable and can crack and fade over time. Polyresin is widely used for bobbleheads as it combines flexibility with high durability. This is the material used for professional, industrial objects and will surely pass the test of time. Ultimately, you can choose the perfect material for your doll and ask for information about this if you are not sure what to pick. Birthdays are a perfect occasion to offer a bobblehead as a gift since it’s all about the celebrated loved one. Create a doll that reflects their clothing style and passions by adding accessories: fishing rods, motorcycles, chef hats, metal detectors, surf boards etc. You can get a doll that will have that person’s signature hairstyle, similar facial features, and custom clothing. Does your loved one have a particular outfit they wear frequently? Make the doll wear it too. It will definitely show them that you know them well enough and it’s a gift that gets a lot of laughs. Your wedding day is a very special event and you surely want to make it memorable for the friends and family that are attending. 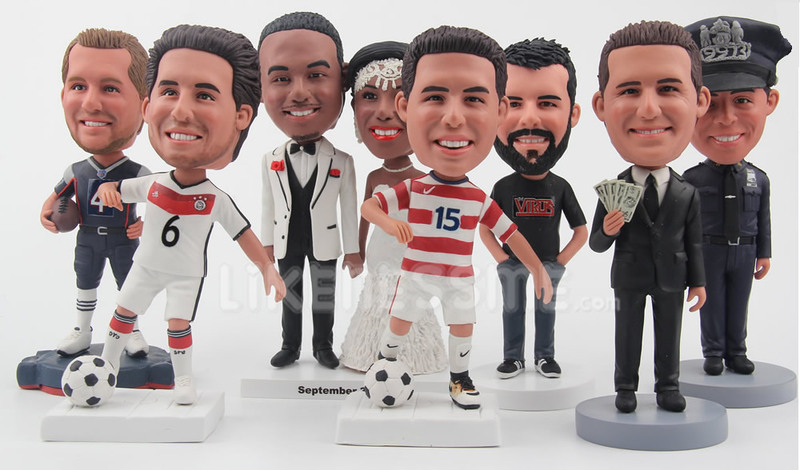 Bobbleheads make awesome, fun gifts for your bridesmaids and groomsmen and your hen or bachelor party will surely be remembered. But this is not all! 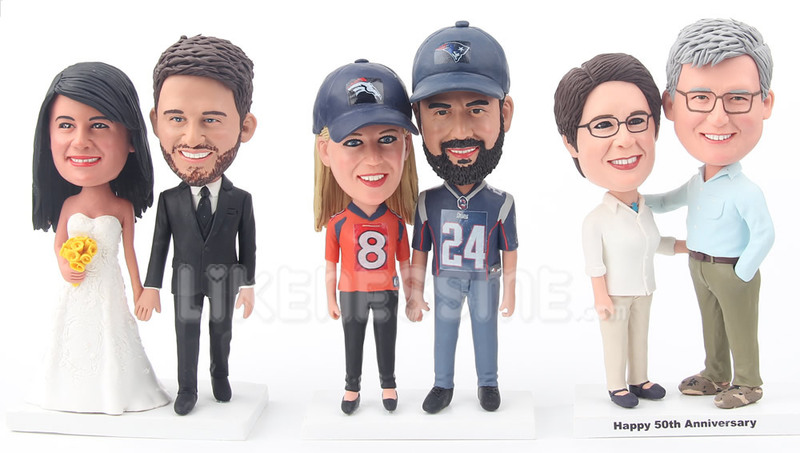 If you want to take it a step further, bring the bobbleheads to your actual wedding, either as giveaways for your guests or even as a cake topper. Retirement is a big deal in a person’s life and you will surely want to mark it in a fun, endearing way for your colleague or loved one. Create a custom bobblehead of them in their work attire, maybe insert an inside joke on the base of the figurine or through a funny prop and you will make their last day at work very enjoyable. Besides modeling a doll after their own look, you can choose a bobblehead of their pet or even their baby. Manufacturers can create animal dolls, celebrities, fictional characters, babies, zombies, historical figures and even your own design. Bobbleheads are great gifts for family and friends at any occasion. In order to offer your loved ones the best gift, you need to purchase it from the best. We have been leading our industry since 2008 for a reason! If you’re still hesitant about which company to choose, feel free to visit this page. If you have any questions or thoughts, feel free to contact us or let us know in the comment section below! This entry was posted in Custom bobbleheads on February 22, 2017 by winter.